It’s 11 o’clock on this Tuesday morning, and the occupants of the Saint-Herblain sports hall squat, located on the outskirts of Nantes, are slowly waking up. The atmosphere is calm: some are brushing their teeth, others are having their breakfast while some have chosen to stay in their tents for a little bit longer. Outside, about a dozen migrants are chatting with each other in the morning sun. 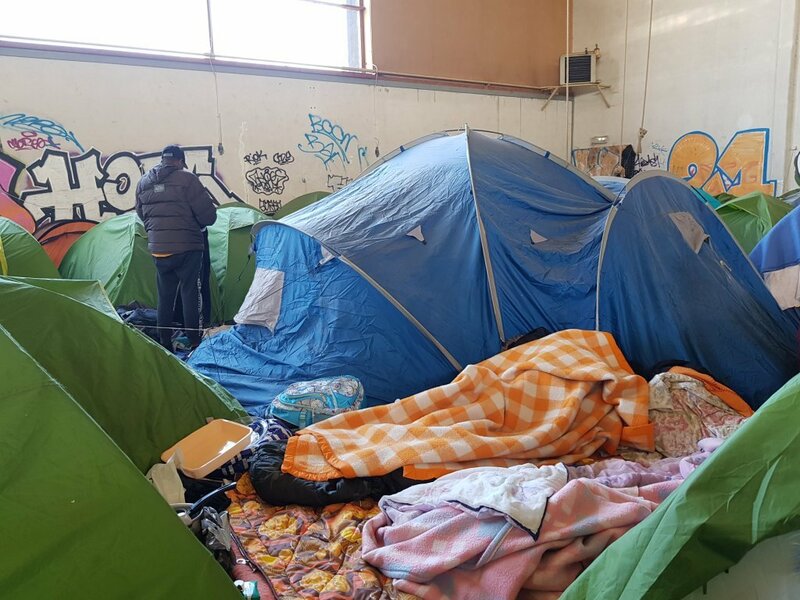 After authorities cleared the migrant make-shift camp in the city’s Vertais square on October 26, around 60 of the evacuated migrants were helped by local NGOs to find refuge in the former Jeanne Bernard sports Hall in Saint-Herblain, a few kilometres from the city center. The premises belong to the Diocese of Nantes, but were abandoned a long time ago. 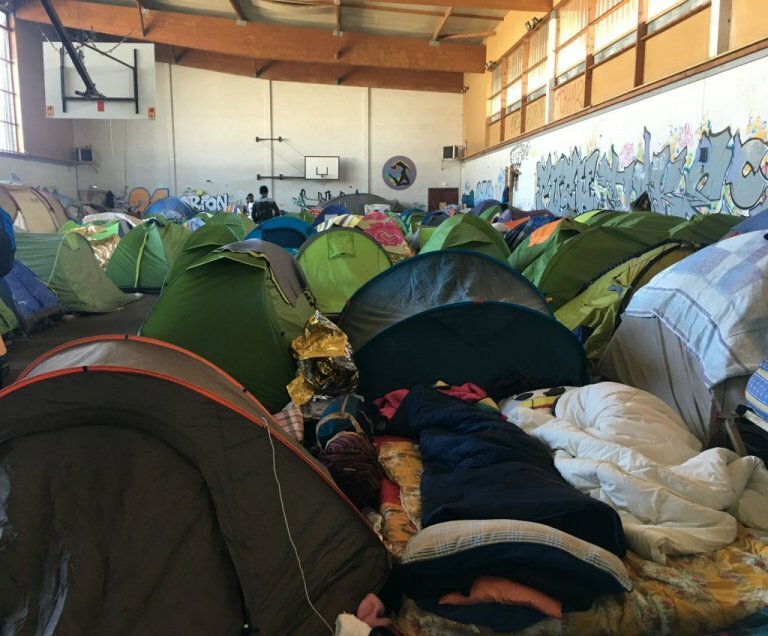 “In the beginning there were about 60 migrants but no other housing solutions were made available and bit by bit other migrants living on the streets joined the squat too,” Juna, who belongs to the local aid group L’autre Cantine (which distributes around 250 meals per night in the sports hall), recounts. Today, the sports hall houses between 250-300 people –including single women – who mainly come from Guinea, Sudan and Eritrea. 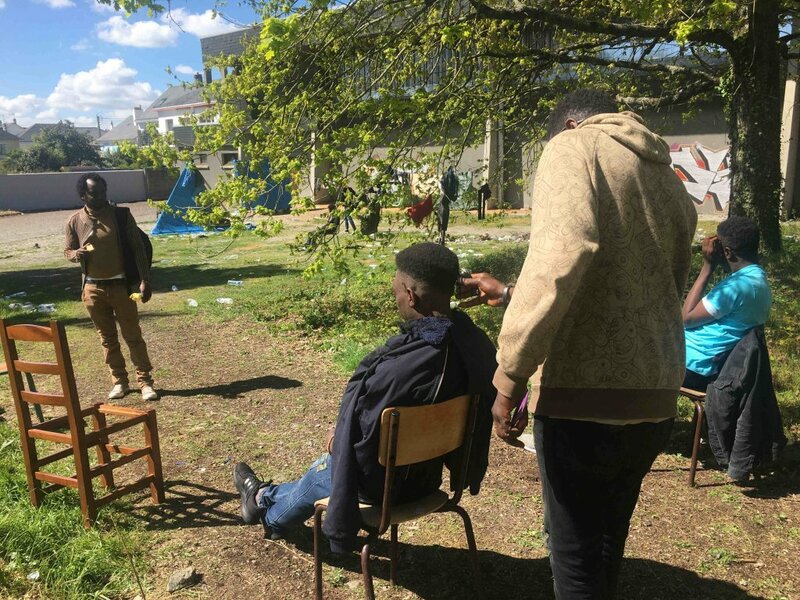 Every time there’s an expulsion rumor in other parts of France, the squat’s resident number swells with the arrival of new migrants from Paris and Calais who are in search of refuge. 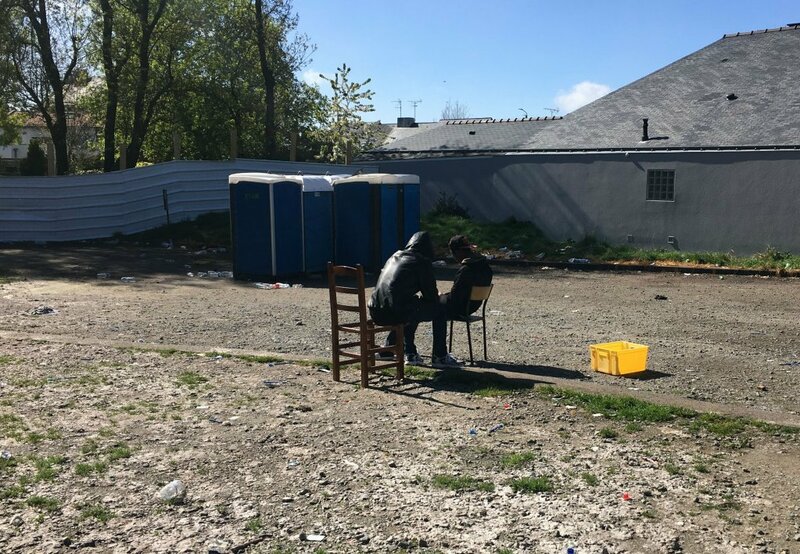 At the end of March, a court ordered the squat to be evacuated within two months in order to give the migrants enough time to find other housing solutions. Sitting next to Mamadou, Manman shows an official document. “The evacuation of the sports hall will take place on June 9, in exactly two months’ time,” the Nigerien explains. 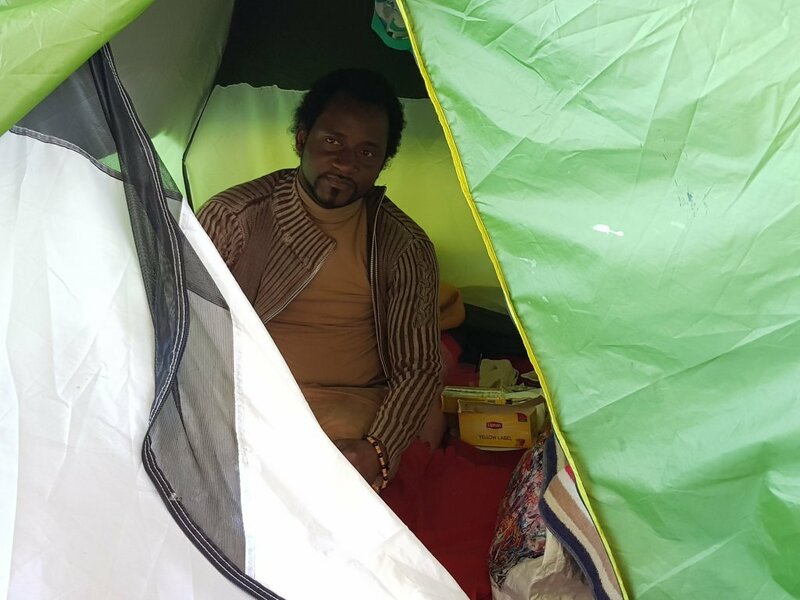 “Another two months in these conditions!”, says Mamadou, who, just like his fellow squatters, hope that the government or the city of Nantes will intervene to find a more viable solution for them. Mamadou, and many of the other squat occupants, is waiting to be regularized. The process is long and includes a meeting with police, an interview with OFPRA, and potentially an appeals hearing before the National Court for the Right of Asylum (CNDS). Many of them fall under the so-called Dublin regulation. None of them have been offered any housing solutions while waiting for their cases to be processed. All of them say they feel abandoned, left to fend for themselves. Sitting by his tent in the back of the sports hall, Ahmed is trying to decipher an official document. The young Chadian solicits the help of a French activist who happens to be around. “I need your help, I have to send a request for the reexamination of my asylum application within five days, but I don’t speak good French,” the young man explains in Arabic. “I have to fill this whole form out,” he says, showing him the OFPRA-stamped documents. His tent neighbors try to help him, for better or for worse. Further away, a group of Eritreans are also having problems understanding documents from authorities. “We’re trying to help Negeset [a 32-year-old woman who has come to Nantes on her own, eds note] to understand what is written,” Asmerom says in hesitant French. “I’m the only one who understands some French,” the young man says. Asmerom is due to meet with police in September. “What do I do while waiting?,” he says of the long waiting time. To fill the void of any official help, the squat’s occupants make do the best they can. 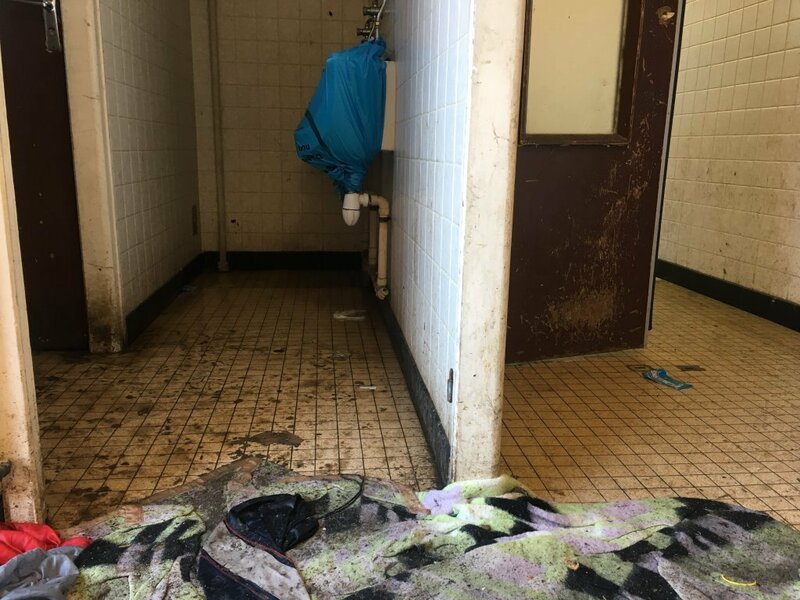 To keep clean, the migrants use the few showers that have been left in the sports hall. “But the water is ice-cold,” Mamadou says after leaving the shower to go to his tent to get dressed. The showers are unhygienic and dirty. In the courtyard, local authorities have installed three toilets, “not enough considering the number of people inside,” Juna, from L’autre Cantine, says. During the day, the migrants try to keep themselves busy. “The Eritreans and the Sudanese put a lot of effort into the French classes” which are held by an NGO, Juna explains. The others watch videos on their phones, chat with each other, listen to music, or play football. Aboubacar takes care of others. On this particular afternoon, the 29-year-old Guinean has set up a makeshift barber shop. “I was a hairdresser in Guinea and so I cut people’s hair for those who need it,” he says as he works his scissors into Ahmed’s hair. Everyone complains about the living conditions and the lack of security in the squat, especially at night, when brawls regularly erupt and quickly get out of hand. “If you get too close, you can get stabbed,” Alpha, another Guinean explains. “It happens so fast, it’s because people are drinking,” Mamadou adds.